You’ve just gotten back from an unforgettable vacation to Hawaii and want to recapture the feeling of being in that tropical paradise. One vivid memory you have is of the intoxicating smell and beauty of the lei that was lowered onto your neck upon arrival. Now what were the flowers in that lei – that’s right – it was plumeria (also known as Frangipani)! These flowers enchanted you at every turn on the Hawaiian landscape. You want to grow plumeria at home but feel geographically disadvantaged because you don’t live in the right planting zone (zone 9-11). But can you grow plumeria inside? What is required for indoor plumeria care? Read on to learn more. Can You Grow Plumeria Inside? Yes, you can, and this article will explain the basics of how to grow plumeria plants indoors year round. You can obtain potted plumeria plants at your local nursery or propagate your own from cuttings. Make sure your plants or cuttings are potted with a coarse well-draining potting mix. A cactus mix, in particular, should fit the bill. However, you may prefer to concoct your own mix. Everyone seems to have their own creative plumeria blend, but a simple mix of equal parts peat and perlite should be more than sufficient. Your goal in growing plumeria indoors should be to emulate their natural habitat as close as you can in order to help them grow and flower throughout the year. The following tips on how to grow plumeria indoors will assist you with this goal. Place your plumeria in a sunny window that receives bright light (direct sunlight) 4-6 hours per day. South-facing windows should be strongly considered because they provide the brightest light for the longest duration. Some people even go to the lengths of moving their plants throughout the day to meet the lighting requirement. Don’t have a great window spot for your plumeria? Don’t despair – you can always try growing plumeria indoors under a fluorescent light for 14-15 hours daily. Given that plumeria is a tropical plant, temperature is another consideration. Maintaining an indoor temperature of 65-80 degrees F. (18-27 C.) would be ideal. When watering potted plumeria plants, water them deeply. However, be sure to let plumeria dry out between waterings because the plants do not like wet feet. Root rot is not a good thing, folks! Your plumeria will also appreciate a little humidity courtesy of a morning and bedtime mist on its leaves. Plumeria are considered heavy feeders. To help encourage plumeria blooms, use a fertilizer low in nitrogen and high in phosphorus at least once every two weeks from spring through fall. Please note that it can be tricky to get a frangipani to bloom despite your best efforts. Additionally, a plumeria has to be at least 2-3 years old before it is mature enough to bloom. Plumerias require very little in the way of pruning. Pruning is only needed to remove dead or dying branches and to shape the plant, if desired. 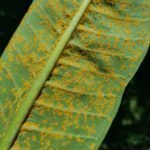 Indoor plumeria care should also include routinely checking and treating for possible insect infestations – spider mites, in particular, are a common affliction of indoor plumerias. Neem oil is always good to have on hand for treating insect issues as they arise. Be aware that a plumeria grown indoors year round is not completely impervious to entering dormancy. It could still be triggered by some environmental factor, for example, a change in the lighting or temperature. When dormancy is triggered, a plumeria will lose it leaves. While the focus of this article was on growing plumeria indoors year round, you can, as many people do, set your plant outdoors during the warmer months. Just be sure to bring it back indoors when the temperatures begin to drop to 55 degrees F. (13 C.) or below.